Suite 1444, 3170 Tillicum Rd. J: I had a great time seeing Tron Legacy 3D with Ed (see his review of it at Linear Reflections), it was only natural to think of food. Practically any activity will make Ed and I hungry. Whether it’s working hard, wandering around town, watching a good movie, thinking of food, eating of food or just breathing. So after two hours in a comfortable seat, we had the urge to shake our legs in the direction of the Zeller’s Family Restaurant at Tillicum Centre. Now you may ask “what’s the point of writing a review for a restaurant that might be gone in a year or two?” My answer would be it’s here now and not all Zellers stores will be closing (to my understanding). 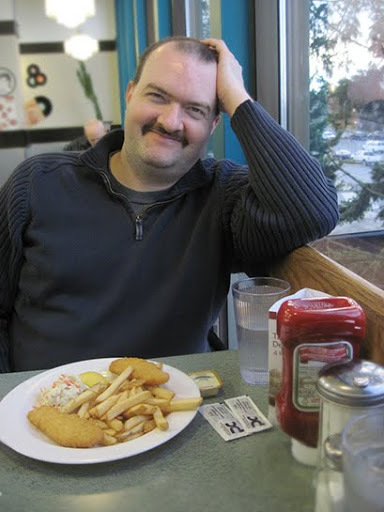 I was a regular at the diner in the Hillside Centre location during the late 80’s to the early 90’s. I’ve always looked forward to many tasty burgers and quick chat served up by bionic waitress June. In the Tillicum location, they copy a 50’s nostalgia in decor and that suits me fine. E: I can certainly say both places had a similar style of decor and I felt out-of-place. There were mostly seniors about. At least here in Tillicum, nothing much has changed.J: But I’m sure Ed will no doubt be frequenting something similar to an Applebee’s soon. He is on the fast track to middle age with seat belt buckled. I was paying this time and it made Ed a very happy man. Resorting to my Scottish roots, I used a 2-for-1 coupon torn out of the 2011 Island Living book I had received as a Christmas gift. 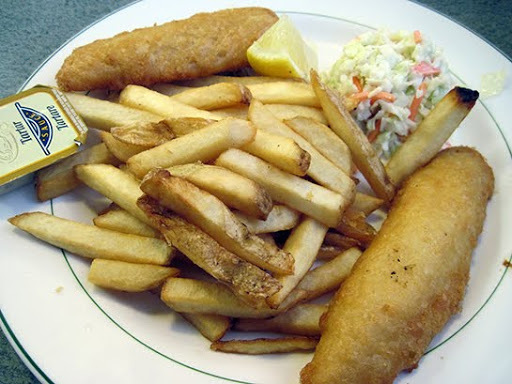 Since there was a limit to the coupon, it was a helping of pub style fish & chips with a side of coleslaw ($7.99). E: At least I’m still 10lbs lighter than you, James. But I don’t see myself hitting an Applebee’s either. I tried it and didn’t think too much of the Hillside location’s offerings. While I did attack the coleslaw first for my much needed fibre, I found what I ate wasn’t over saturated with mayo. But this isn’t real cole slaw. J: Our plates were brought to us with a helping of tartar sauce and (drum roll please) a slice of lemon! Did you hear that Langford Salty’s Fish & Chips? I had to go to a diner to actually get a slice of lemon and I didn’t have to ask for it. Anyways, I tasted my catch-of-the-day and discovered it was netted in a supermarket (or Zeller’s). It tasted like prepackaged fish and was possibly the BlueWater brand, my favourite. The fish may have been oven baked which would explain the nice crunchy batter on the outside while remaining soft and fluffy on the inside. E: I did notice outside the diner that there was a sign mentioning they have their own home-made batter on their Wednesday special. But either way, I did enjoy the fish too. And the chips? They were fairly decent. I wouldn’t say perfect. J: I was satisfied. It was one of those meals that leaves you feeling partially hungry until you get up and walk a few paces. I honestly hope the Tillicum Zellers stays. I’m not ready to give up one of my favourite places to eat just yet. This entry was posted in Food, Shopping and tagged Breakfast, Lunch, North American, Saanich, Seafood. Bookmark the permalink.